So, your project is underway. You can see the structure coming together and features being fitted, but, as with any project it’s not without its stumbling blocks. That wall just got completed? You know the one that just had a pipe dragged past it and now looks like a car caught in a hailstorm? How do you manage the repair of this from start to finish?! Developed as simple, yet powerful cloud-based solution, Defex allows you to log this defect and work with your team across multiple disciplines to repair the problem. 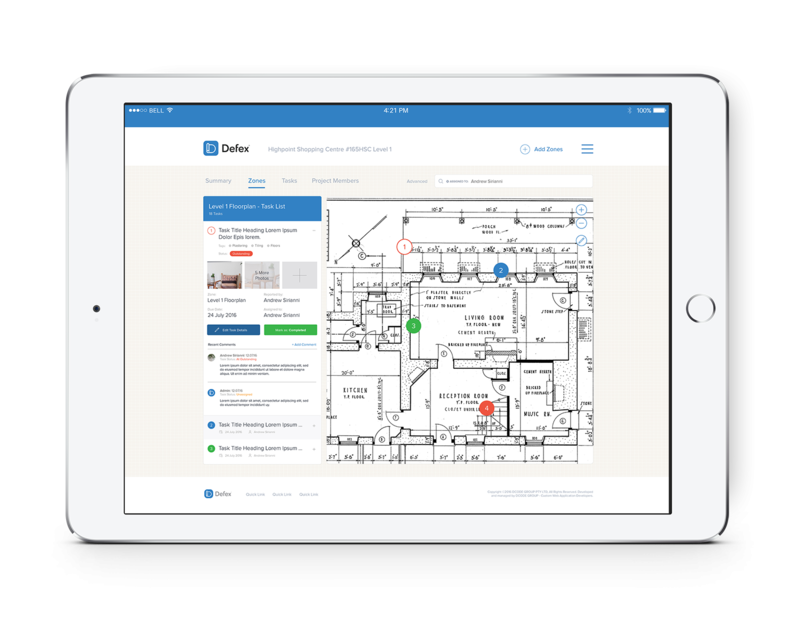 Accessible from your computer, tablet or phone, Defex requires no software and can be accessed by your entire team from the one plan. ‘Simple’ we hear you say, what famous last words. But we do mean it. To log a defect, all a user has to do is go the right floor plan and click on the spot on the plan where the defect is. From there, you can add a description, photos, completion dates, status and which user it’s assigned to. From this, it’s then assigned a number which shows up on your floor plan. By using Defex as a project management software, you can more efficiently and more effectively track problems with your project. Defects still remain in the log when marked as completed meaning no part of the project is missed. Defex combines a simple summary system combined with a powerful filter tool meaning when multiple defects are in one section you can see a list of individual defects and their status.